This morning was a "Get Out Of Jail Free" morning with nothing on my calendar. When I asked Jilda what she had going, she had a pile of dress clothes that needed ironing. I asked her if she wanted me to take them to the cleaners for pressing, but she told me she enjoys the zen-like state she falls in to when she does that chore. Well then. There was nothing left for me to do but go fishing. Ten minutes later, I was in my truck and on the road for the short trip to the river. Part of the fun of any fly fishing trip to the Sipsey Fork of the Warrior River is stopping by the fly shop to get the fishing news. It's almost as much fun hearing Randy tell about catching fish is it is to catch them myself. He's been fly fishing for many years and knows when and what the fish are biting. I could have stayed there all morning, but the sun was already getting warm, so I headed to the water. Once in my waders, I walked down to the water's edge. The air was already in the mid 80s but I could feel the cool water on the light breeze. Wading in, the cold water felt good on my shabby knees. When I was almost waist deep, I pulled the thermometer from my fishing vest and held it under the surface of the water for a minute. When I pulled it up, the mercury read 51 degrees. Up river, a mist hung over the water like a cotton blanket. Out of the mist a Great Blue Heron waved toward me above the water cruising for a trout breakfast. I fished for a few hours and got strikes, but none took the fly. I've gotten out of practice, and that's something I want to remedy in the coming months. When the weather cools off, in autumn, the fishing is better. Even though I didn't catch any trout, I felt taller when I waded out of the water. It was a good day to fish. Sounds like a nice day out in nature! Almost any day is a good day to fish. My hubby would say there is no bad day to fish! Sounds like a lovely day for you and I hope your weekend is as nice. Cooler weather heading our way Sunday and then next week. I'm hoping the worst of the heat is past for this year...hoping! Oh the memories. We used to follow my father along the river bank with a frypan. When he caught was when we ate. Rainbow trout. Mmmm. It sounds like a wonderful day. Ironing? Not a fan. Glad you had a great day fishing even though you didn't catch anything. I never thought of ironing as meditation but bless your wife for feeling that way. It isn't about the fishing even though catching some is nice. 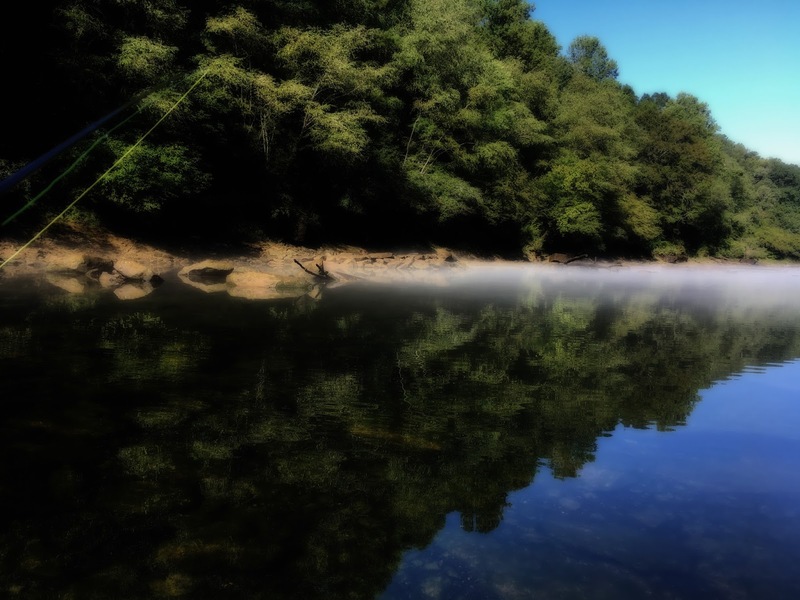 It's more about the solitude and motions of fly fishing that leaves you feeling so satisfied. I have a friend that irons absolutely everything--never could understand that!! When I fish I enjoy seeing fish but prefer not catching them.